It turns out, according to this program, almost everyone has an instant response of one or the other, and they will continue to defend their initial response even after they have time to reflect and ask questions to define more carefully what the superpower entalls. How fast can you fly? Will my clothes also become invisible? Can I turn it on and off at will? All very good questions but none of the answers seem to sway a person from their initial response. By this time I’d pulled into the Lake Kegonsa State Park parking lot near the trailhead of one of my favorite paths that would take me past the restored prairie and down to the lake’s edge. When the program ended, I walked along the prairie’s edge trying to imagine flying over the prairie and out over the lake. One of the most exciting experiences in my life was piloting a glider, feeling the rise of the small plane as we crossed over a lake, using Earth’s natural thermal heat to rise up and prolong our ride. Each time we found a heat source, we could use it to rise higher again but eventually we glided down and lined up with the runway of the small airport. Landing required carefully counteracting the rise caused by the heat of the paved runway so I reluctantly turned the controls back over to the instructor. I recalled another a day on a different prairie, one of those first days in the spring warm enough to enjoy the breeze. 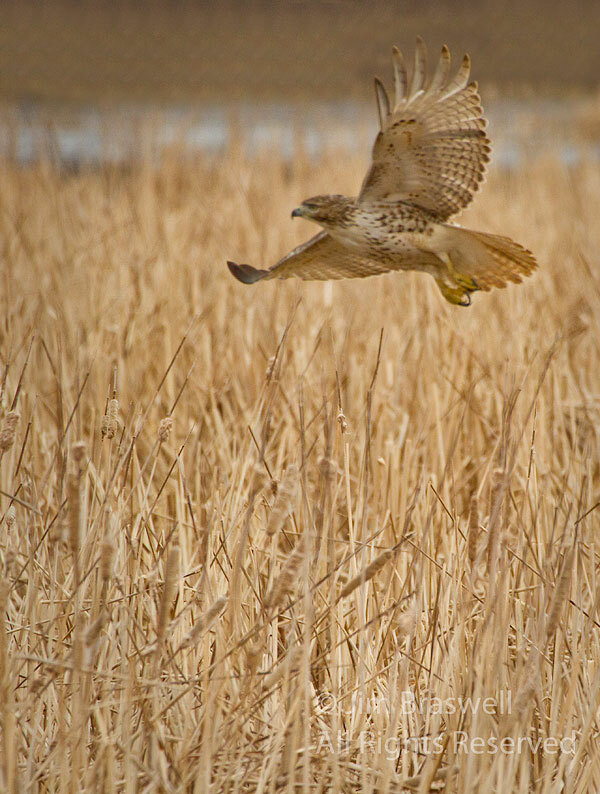 I saw a young red-tailed hawk high above and paused by the side of the road to watch him as he slowly descended, making use of the thermal rise to lift again and then come closer to the prairie floor with never even a flutter of wing. He saw me watching and showed off his dive, pulling up just before hitting ground. I knew he would but still my heart stopped as he got within two feet of the ground. He saw that I watched, and knew I was delighted. So he did it again, this time coming straight down from an even higher start. I clapped, not sure if Hawk culture would understand the noise as joy, perhaps it would scare him off, but my response of applause sprang from a deep place within me that needed to express my joy. Fortunately for me, the Hawk, now affectionally named “Red,” seemed to understand my response as a form of admiration and continued to perform his aerial stunts. He turned in tight spirals, flew down as though to pounce on a mouse, and then high up turning in wide spirals. He circled around me from time to time, making a perfect circle with me as the center point, each time coming closer. At times his shadow brushed over me and I could FEEL his shadow as its coolness crossed my face. I felt embraced by this wild being and, even though I know you might say “anthropomorphizing,” I say no. This guy knew I was watching and took pride in showing off his skills. He enjoyed my adoration and returned the favor by letting me know he was glad for my presence. After about fifteen minutes, he left after circling one more time in a wide arc at the exact height of my head. I think he might have said “Excuse me, I need to go hunt for dinner now” but that would be anthropomorphizing. I then recalled a dream I once had in which a number of large birds were running, getting ready for take off. At the last moment, one bird (the one that really looked a little like BIG BIRD now that I think of it,) suddenly couldn’t take off with the others. She clung to the tree sobbing in the most heartbreaking voice “Why can’t I fly?” I didn’t need a therapist to know that one represented me and demanded some life adjustments to awaken my flying abilities. For awhile “the Bird That Can’t Fly” was a theme, showing up in my paintings and my jewelry collection as I learned that many birds don’t fly, but use wings as a way to glide down from trees and help them propel up small inclines. Another NPR program included the theory that this is why wings developed and only after a long evolution in wing design was flight possible. So on this day, asked to choose between being invisible or flying, FLYING was the only possible choice. I imagined scenes of the Grand Canyon properly explored, or in Washington DC flying around the Washington Monument. I would drop water balloons on duck hunters and take kids on rides just for fun. I’d jump off of Yosemitie’s Half Dome and enjoy the amazing thermal updrafts of Yellowstone’s Old Faithful. Games in my mind to help pass the day.